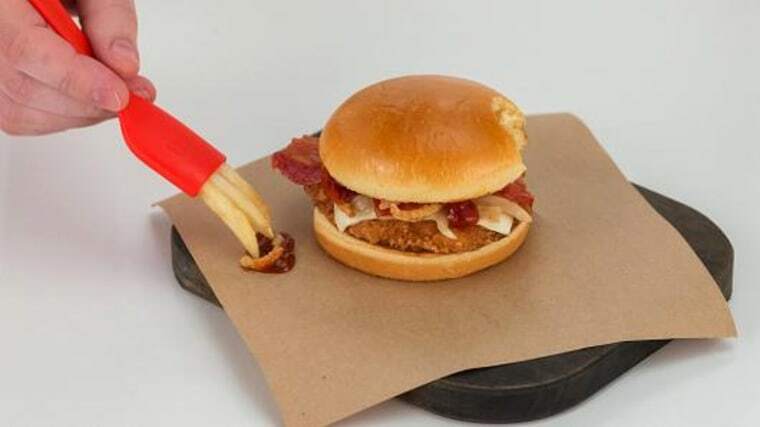 McDonald’s wants to get the word out that sandwiches in its new Signature Crafted Recipes line-up are so packed with toppings that you'll need a special utensil to deal with it — the Frork. The burger giant is touting its Frork, basically a fork with French fries as the prongs, in a mock infomercial featuring pitchman Anthony Sullivan. "Will the Frork change your life? Probably not," Sullivan says in the video. "Will the Frork improve your Signature Crafted Recipes eating experience? I mean, sure... maybe." McDonald's said the "superfluous" utensil is designed to help customers scoop up every last bit of the company's new premium burgers and chicken sandwiches. The Signature Sandwiches are customizable, upscale burgers and chicken sandwiches that feature flavors like Pico Guacamole, Sweet BBQ Bacon and Maple Bacon Dijon. "We started with All Day Breakfast, updated our Chicken McNuggets, offered new Mac sandwich sizes for every occasion and now we're introducing Signature Crafted Recipes because they are inspired by our customers," Michael Haracz, McDonald's chef, said in a statement. "And while the Frork is supremely superfluous, it shows that McDonald's is willing to do whatever it takes to help them enjoy every last bite." A limited supply of Frorks will be available with the purchase of a Signature Crafted Recipes sandwich on May 5 at participating restaurants. These sandwiches sell for between $4.99 and $5.19. In true infomercial style, the ad features a toll-free number that gives callers a chance to get a free Frork or a coupon for a free Signature Crafted Recipes sandwich. Whitten is a social media writer for CNBC.